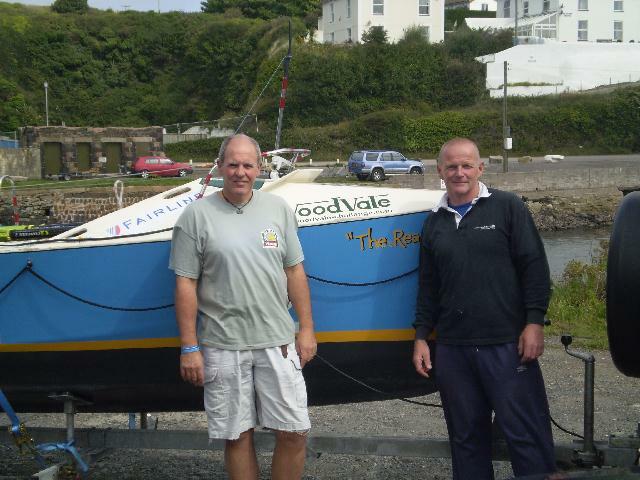 'The Reason Why' is now off to take part in the 2009 Atlantic Rowing Race with new owners Jim Houlton and Paul Milnthorpe, racing under the name of 'The Atlantic Vets'. Jim and Paul will be raising money for 'FARM-Africa' and 'WaterAid', and their website is www.theatlanticvets.co.uk We wish them good luck in their forthcoming adventure. Paul and Steve handing over a cheque for £24,000 to Cornwall Hospice Care, with CHC representatives Jane Appleton and Aimee Medlin holding crossed oars. 'The Reason Why' all hitched up and leaving Cornwall. A short video below, courtesy of Roger Haines, showing 'The Reason Why' just leaving La Gomera at the start of the 2007 Woodvale Atlantic Rowing Race. The Reason Why #42 from Roger Haines on Vimeo. 25th May 2008:- Good news - it looks like 'The Reason Why' may have a new owner and is off to sea again! Obviously the sale is due to a thorough marine survey so fingers crossed she passes with flying colours - no reason why not as she is a great little boat. 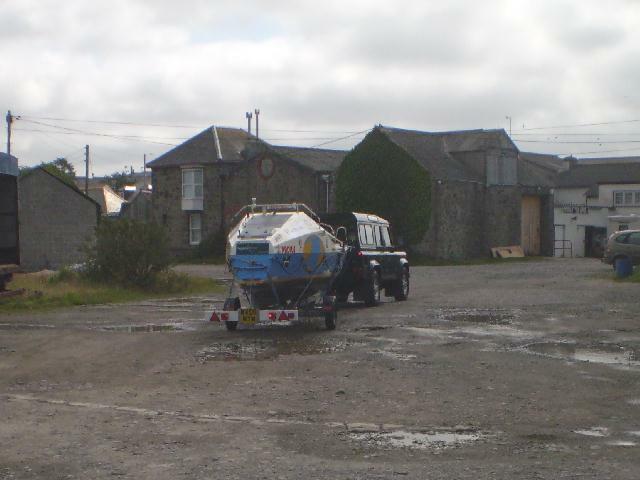 6th May 2008 - Any budding ocean rowers out there interested in buying a fully equipped atlantic rowing boat complete with its own trailer??? The boat is in pretty good order - more than can be said about the contents! The best place for the left-over Pot Noodles, Go-Bars and dried food etc is in the nearest bin! As for the clothes that were in a sweaty and smelly state at the end of the row, have since been left to 'ferment' since the end of January in the Antiguan heat, followed by several weeks in a shipping container ........ well, best they join the Pot Noodles in the wheelie bin! What now for 'The Reason Why'? 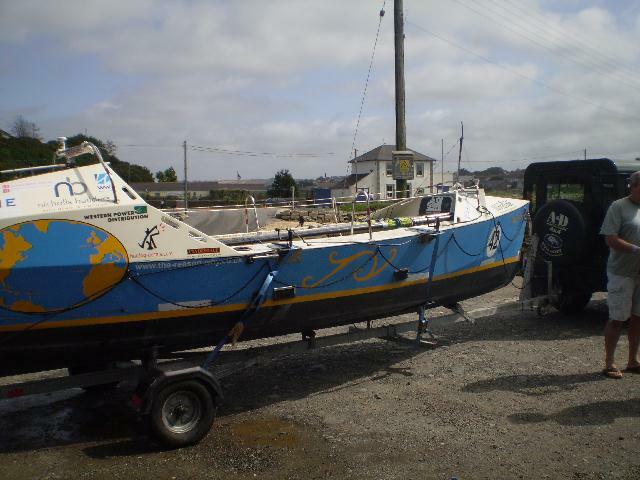 Well, we have a few people who are interested in buying her in order to take part in the 2009 Atlantic Rowing Race. So she will be cleaned out and then hopefully sold on to the next brave soles who decide to take on the challenge of living on Mo for weeks on end beneath the Grinning Turk, perhaps with their own Gus for company! We will keep you updated when we have further news. 4th April 2008:- 'The Reason Why' is due to arrive back in the UK within the next couple of weeks. We have already had several people who have shown interest in buying her which is great news. Once she has been sold, we will be able to let you all know how much money has been raised for Cornwall Hospice Care. Donations are still coming in which is fantastic so if you haven't donated yet and would like to, please do so - it's not too late. We will keep you updated as and when we have further news. 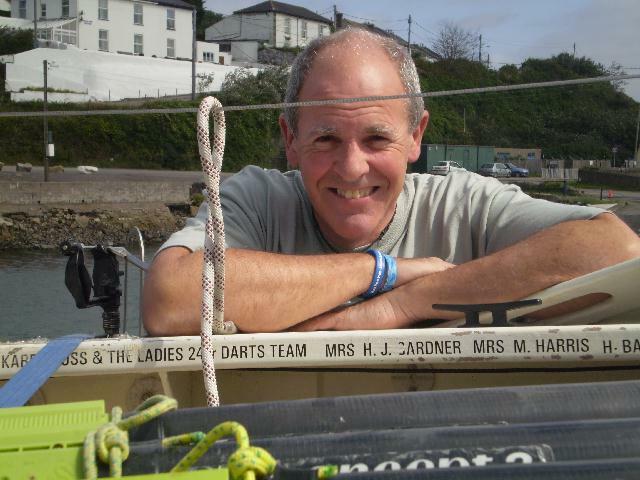 Zennor Gig Club rowers Steve Gardner and Paul Harris have joined the ranks of an elite club of sportsmen after completing a mammoth 2,936-mile cross-Atlantic charity race. According to Steve, who at 51 was the oldest competitor, more people have climbed Mount Everest and been into space than have rowed across an ocean. Supporters lined English Harbour in Antigua waving distress flares and sounding klaxons to guide the pair through the last few strokes of their gruelling journey. As they stepped onto dry land they became the 200th crew to successfully row across an ocean. The two friends had set out in their 23-feet self-built boat 'The Reason Why' some 55 days, 12 hours and three minutes before, from La Gomera in the Canary Islands. Contracts manager Steve said the trip had been "absolutely sensational" and declared they had still not come back down to earth. "We just hoped to finish so to come in the first six, and fourth in the pairs, is more than we could have dreamed of," he said. "There are crews of youngsters and marines out there who have not even finished the course yet. "Our calf muscles are screaming out as we haven't walked for nearly two months." The duo followed in the footsteps of Olympic gold medallist James Cracknell and TV presenter Ben Fogle who competed in the Woodvale Atlantic challenge two years ago, filming their progress for the BBC. The aim is to raise up to £25,000 for Cornwall Hospice Care through sponsorship and the eventual sale of the state-of-the-art boat. The pair have already been contacted by potential buyers but nothing has been decided yet. Steve explained that the trip had contained a few 'hairy' moments when their plywood craft came almost within 'touching distance' of massive tankers and towering cruise ships. He said: "We had radar on-board so we knew when large vessels were close but some of them are a bit naughty and don't turn their systems on so it's a bit frightening. It was spectacular at times with pods of dolphins, whales and huge flying-fish travelling through the air." Steve, who lost two stones in weight during the voyage, said there had been a few difficult moments, particularly Christmas Day and New Year. "It's hard spending so much time together on a 23-foot boat but I think we got off better friends than when we got on." Paul, who works as a technician for Western Power, said it felt strange to be back in Connor Downs and back at work. "It all seemed to go really quickly, looking back, as if it never happened," he said. The 46-year-old laughed off references to record-breaking Olympian Steve Redgrave, who famously asked to be shot if he ever got back in a boat, and vowed not to undertake another ocean trip. "Well there's an Indian Ocean race in 2009 but I am happy to go on record as saying I will not be doing it." Annie Binding, appeals manager for Cornwall Hospice Care, said: "It is an absolutely incredible feat and I take my hat off to the pair of them. It's not just the rowing but the amount of work they put in beforehand building the boat. The money raised is absolutely vital as we need £5 million each year just to continue our work. I'm hoping to see them both for a party and buy the pair of them a beer to say thank you."